Well, here it is. 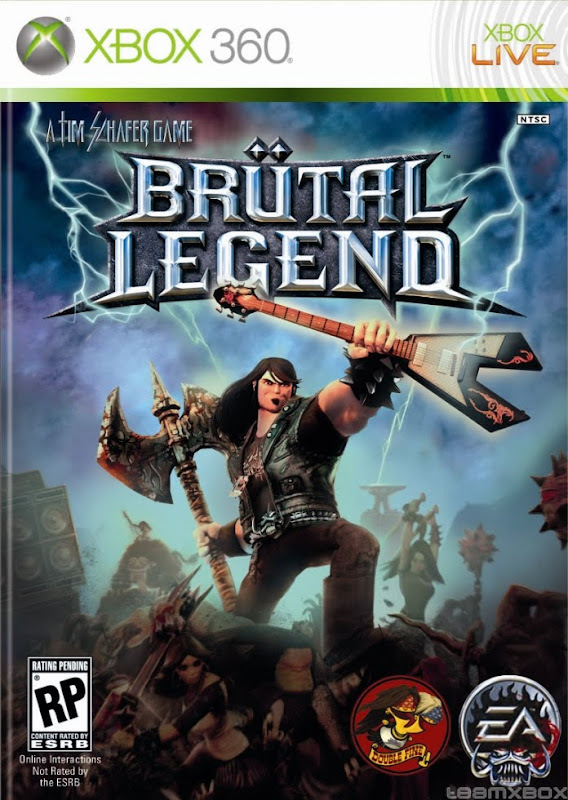 Brütal Legend, possibly the most hyped game of the year, has finally fallen into my lap to be judged. So, the question is up in the air: does it live up to the hype? Let's find out. We start of the game with a cut scene of protagonist Eddie Riggs (voiced by Jack Black) helping out a “New Metal” band that has no respect for Eddie or “Metal” itself. To make a long story short, Eddie gets crushed by the set and is then saved by the Fire God of Metal, who ends up taking Eddie to an alternate version of the past (sounds like another story I know...hmm...) in which metal is worshiped and demons have all but enslaved humanity (okay, now I know I've heard this story before...). So, after grabbing a giant axe and finding out his guitar can cast magic with naught but a few chords, Eddie joins up with the other “Ironheades” and gets ready to take on the evil emperor Doviculus. As I started to play the game, I was excited to get into a good, old-fashioned hack-and-slash, overworld type of game. I knew about the RTS/Freedom Fighters-esque mission involved with the game and looked upon it with some interest, in the hopes that it would break up the gameplay. However, I didn't realize how incredibly often these missions would pop up. The multiplayer (which is highly lacking in expandability, as the only match type is skirmish) is also unfortunately based around this gameplay style. 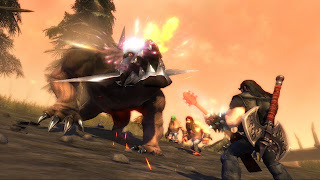 The world of Brütal Legend is beautifully executed  almost enough to make you forget about the gameplay style...almost. With superb, cell-shaded art, a well-developed background mythos, and gory deaths, the developers at Double Fine definitely know how to immerse a player in a world. 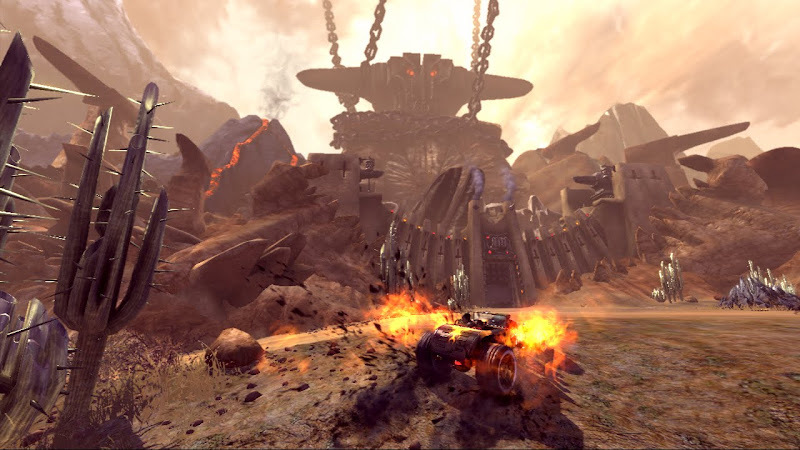 Add your car's ability to play songs that you unlock both in game and during the campaign and players will find that some of the best times during the game are cruising across the landscape listening to metal while running over some demented deer. Even so, this is a definite one-and done game (unless you're going for achievements). One of the major problems I have with Brütal Legend is the amount of repeated dialogue. For a game that boasts some of the best writing and voice acting talent around, I fail to see why I'm stuck with characters saying the same four or less lines during both overworld and stage missions. It only gets worse when Eddie begins to talk, because all that seems to come out of Jack Black's mouth are dumb jokes and random puns. Also of note is the badly-designed leveling system. In order to level up, players will need to do two different things. First, they will gain fire tributes to upgrade Eddie's car, weapons, and special attack combos. Second, players will have to free (no joke) ball-gagged dragon statues to upgrade their attributes. And when the dragons are freed, players will not even get to choose their upgrades. The game does it automatically, really taking some of the minimal customization that is in the game away from the player. The worst part of this system, though, is that it breaks up the gameplay by demanding that players move away from the Campaign for about 20 minutes at a time to go and find more fire tributes and gagged dragons. All-in-all, my gripes with this game are small shots compared to the overall picture. Double Fine wanted to make a game for “Metal Heads,” by “Metal Heads,” and they succeeded completely, despite some gameplay slip-ups and limited replayability. So, did it live up to the hype?